Review date: 22 January 1998. DVD, which variously stands for Digital Video Disc, or Digital Versatile Disc, or nothing, depending on who you ask, is pretty cool. As a computer data storage format it hasn't yet taken off - although its monstrous capacity makes it hugely promising. But for movies, it beats the heck out of VHS. DVD delivers about the best video you're ever going to see on your current TV. There are occasional artefacts of the MPEG-2 compression process - crosshatched things like grilles and wicker chairs can change texture, for example. But you've got to be looking for 'em; if you just relax and watch the movie rather than keeping a hawk-like vigil for imperfections, you'll never notice a single glitch in most DVD films. The range of movies you can get on DVD is still a bit limited - no Disney animations, no Spielberg movies, no Star Wars, no Titanic - but the number of titles that are available is now big enough to attract even movie buffs. The problem, though, is price. Consumer "blackgoods" DVD players to slot in with the rest of your hi-fi equipment still cost around $1000 (Australian dollars). This is three times the price of a decent stereo VCR, and the DVD player can't even record. The bargain solution is to add DVD capabilities to your PC, with a DVD upgrade kit of some kind. If you're happy to play DVD movies on your computer screen, and you've got a reasonably fast processor (any Pentium II from a 300MHz on up, or any G3 Macintosh, will do) and a recent, high speed graphics card, there are several software DVD players that do a decent job. If you've got a video card with a TV out connector, there's a good chance you'll be able to get a quite acceptable image onto a TV, too. You won't have an output for a Dolby Digital (AC-3) surround sound decoder, but your sound card output will work with a Dolby Pro Logic decoder, so home theatre on a budget is certainly possible. Software decoders like DVDExpress from Mediamatics can even decode Dolby Digital 5.1 channel audio and output it through a multi-channel sound card. But if you want something closer to the full capabilities of a regular home DVD player, and you don't already have several hundred dollars worth of CPU and video and sound cards, you need to use dedicated hardware. Jaton's Magic DVD upgrade kit is a cheap - $450 (Australian dollars) - way to do just that. The Jaton package is built around the Magic DVD decoder card, which allows full speed DVD playback on any PC from a Pentium 133 up, and even permits multitasking while you play movies, which is more than you can manage with a software player. The card is very closely related to RealMagic's Hollywood+ decoder, which is a very good thing; the Hollywood+ has arguably the best decoder chipset currently available. On the back of the decoder card there's a regular sound card-style 1/8th inch stereo audio output, a round VGA input connector and a standard 15 pin VGA output connector, and a mini-DIN Y/C video output (if you're wondering what the heck "Y/C" means, check out my video format overview here). The Y/C output doubles as a composite video output, with a little Y/C to RCA adaptor cable that's included with the package. If you want to use the composite output, you'll need an RCA to RCA plug cable to hook it up to your TV. Incidentally, the S-Video to composite adaptor cable will not work on standard S-Video connectors. The Jaton card, and anything else that supports this kind of cable, has a couple of extra pins wired on the connector that carry the composite signal. The adaptor cable works no magic, it just connects to those pins, which are ignored by regular S-Video cables. It will do exactly nothing if you plug it into a "pure" S-Video connector. There's also an RCA S/PDIF output connector. S/PDIF (Sony/Philips Digital Interface Format) is an audio transfer protocol that can use either optical or electrical connectors - electrical, in this case. It's used to transfer either 16 bit stereo audio data between various components (CD players, Digital Audio Tape decks, some sound cards), or to transfer Dolby Digital (formerly known as AC-3) 5.1 channel audio for movies. If you've got a home theatre amplifier with an S/PDIF input, you can hook it straight up to the Jaton decoder card and enjoy Dolby Digital surround sound from any DVD that features it. Click here to jump to the sidebar on DVD movie audio. You also get a Hitachi GD-2500 DVD-ROM drive. This is a 4X (5.52 megabyte per second) EIDE DVD reader which also works as a 24X CD-ROM drive (3.6 megabytes per second maximum transfer rate). It can also read CD-R discs, a feature missing from early DVD-ROM drives. The box contains all of the cables you'll need for a basic computer-only setup, and a copy of the shooting-people game Virtua Squad 2, which has nothing at all to do with the Magic DVD package but is bundled with pretty much everything Jaton makes. One can only presume Jaton bought the discs from Sega by the tonne. The only significant omission from the hardware package is a remote control. For the money it's a bit much to expect one, but if you're going to play DVDs on your TV a simple remote pause button doesn't hurt. As it stands, if you want to grab a snack or answer the phone in the middle of a movie you have to get up, go to the computer, spool the video back a bit to cover the stuff you missed while you were walking and the stuff you'll miss when you're walking back and then pause the video. But hey, it's cheap. Installing the DVD package is easy enough. The DVD-ROM drive looks, at a glance, just like a regular IDE CD-ROM drive and installs in exactly the same way (for info on how to install drives, check my article on how to build a computer). The decoder card installs in any PCI slot. 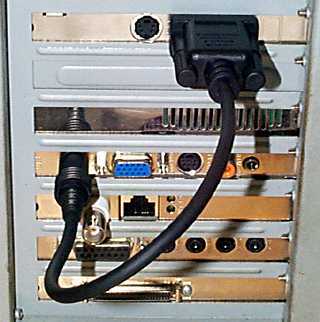 Like all low cost DVD decoder cards, the Jaton handles DVD playback on the computer monitor by means of a VGA overlay procedure, using a passthrough lead on the back of the computer which attaches to your video card's output and the decoder card's round input connector. 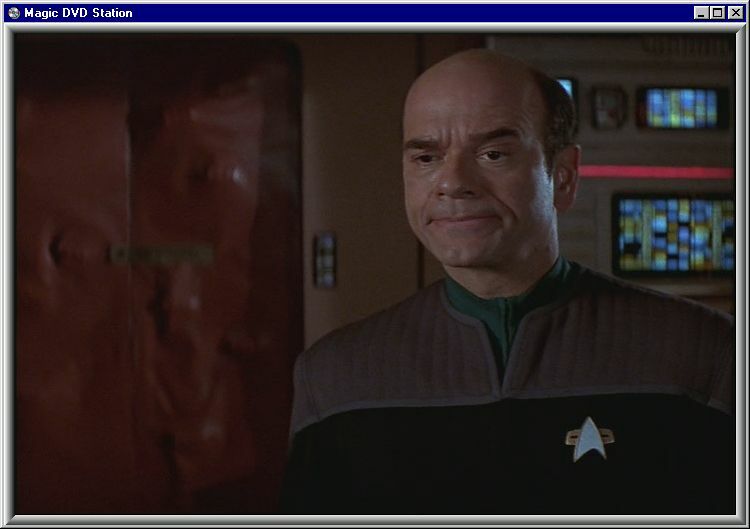 When playing a DVD, a solid block of colour in the playback window is magically overlaid with the video. Unlike earlier PC video overlay systems using the dreadful old VGA feature connector, this actually works, and works well. You can get full screen playback by double-clicking on the video window. 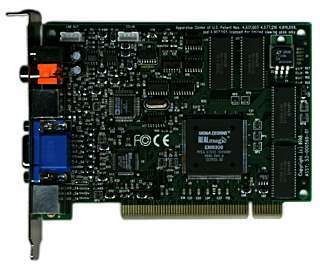 More expensive DVD decoder cards, like those based on the Chromatic Labs MPACT-2 chipset, are a video card and DVD decoder in one. They can directly output 24 frame per second MPEG movies in full screen mode to a computer monitor at 72 Hertz (Hz - in this case, used interchangeably with "frames per second"). They do this by simply displaying each video frame over three output frames. Computer monitors can't handle refresh rates as low as 24Hz. 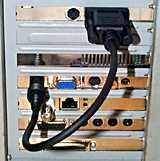 You can also install the 1/8th inch stereo jack audio passthrough cable from the decoder card's output to your sound card's line in, if you want DVD audio through your computer. You cannot forego both passthrough cables if you're happy to use only the video connector and hook the audio straight up to some other device - if the video passthrough lead isn't connected, the decoder board doesn't work. If you want to connect the decoder card's audio output straight to your VCR or TV or whatever, you'll need to buy a 1/8th inch stereo to dual RCA connector lead. Installing the DVD software and drivers is easy enough. The included software CD-ROM comes with specific Windows 95 and Windows 98 drivers and software - a nice touch. The Win98 installation procedure is very simple; Win95 is likely to do its usual idiotic "tell me where the files are, again?" routine. The software supports DVD's interactive menu features, so you can use the "jump to scene" and view the extra info included on many discs, and is generally pretty easy to use. You can grab frames from DVDs that permit it (not many do), and making track playlists and selecting different video modes is all easy enough, and explained well in the help files. If you only want to play DVDs on your PC screen, this package is perfectly adequate. Mind you, playing movies on your monitor is not the optimal way to watch a flick, but if that's what you want, this'll do it for you. As you install the software, though, you get to pick which region you want the Magic DVD to be. Regions are the bane of DVD connoisseurs. The Magic DVD allows you to change your region only five times. The Hitachi drive is reported not to store region code changes (some others do, and can only be reset by the manufacturer), but the package still remembers how many times the region has been set even if it's installed in a fresh computer. I found no region-setting or region-ignoring cracks that worked with the Magic DVD. This situation may have changed by now, though; check http://www2.datatestlab.com/regionhacks/ for the latest attempts. If you're viewing movies on your computer monitor, you have to put up with a window frame, until you figure out that double-clicking the video expands it to proper full screen. The Magic DVD software CD, by the way, contains a ton of clips of Star Trek: First Contact, from which this frame was grabbed. You do NOT get the whole movie. It's more like a trailer on steroids. The Jaton package supports full frame, letterbox, pan and scan and widescreen video modes, so you can play almost any disc on almost any TV - to use widescreen mode, you need a widescreen TV. The different "widescreen" formats give you an image that's the same shape as the wide movie screen, but they aren't necessarily better. Many movies are shot in TV's 4:3 (width by height), non-widescreen aspect ratio - the actual frames of the film have a 4:3 aspect ratio. The frames are cropped down for cinematic release, so the non-widescreen version may actually contain stuff you couldn't see in the cinema version, but which was intentionally included by the director. This is the explanation for some of those amusing boom mikes that droop into frame in non-widescreen versions of movies, when you could have sworn you didn't see them in the cinema; you didn't see the mike in the cinema because you didn't see all of the frame! The Jaton decoder card also has the novel feature of permitting NTSC DVDs to be played back on PAL systems, and vice versa. Many DVD players can play both PAL and NTSC discs, but they require a multi-system TV because they can't output one video format from a disc encoded with the other. There are also "partial conversion" DVD players, which can output NTSC video as "60Hz PAL", a signal encoded in the PAL fashion but at 60 fields per second instead of PAL's 50 (for an explanation of what the heck a field is, see the Bob and Weave sidebar here). These players require a 60Hz PAL TV or video monitor; people who own an old PAL Commodore Amiga monitor like the model 1084 I use as a TV should note that these monitors do work with 60Hz PAL, but don't work with true NTSC - they give the same black-and-white picture that many PAL-only TVs deliver when fed an NTSC signal. The Magic DVD package doesn't support 60Hz PAL, but apparently a future version of the drivers for the very similar Hollywood+ card will, so it's possible the benefits will trickle down. Playing NTSC DVDs on PAL equipment causes noticeable crawling of high contrast horizontal lines, because the decoder is adding extra lines to stop the image from looking vertically squished. NTSC has 525 lines of resolution, PAL has 625 - explained in more detail in the video format comparison here. You can see the same effect on US news shows rebroadcast in PAL countries like Australia, but DVD's high overall resolution reduces it somewhat. Like MPEG-2 artefacts, this is not noticeable unless you're looking for it, except in rare circumstances - black and white Venetian blinds, for example. A more noticeable effect of playing NTSC on PAL is frame rate oddities. Both PAL and NTSC DVDs often contain 24 frame per second (fps) data, because that's the frame rate of the original movie. 24 fps movies can be played as 25 frames per second in PAL mode by simply, well, playing them at 25 frames per second. This results in a 4% speedup, which finicky viewers complain about. Regular PAL VHS video movies have the same problem. If you live in a PAL country and you're wondering why your "138 minute" DVD or video movie finishes five minutes early, that's why. Some "made for TV" movies are shot at 25 frames per second, but they're very much in the minority. The Jaton package, and the Hollywood+ it's so strongly related to, don't seem to actually handle the NTSC to PAL conversion this way, though. They just appear to repeat one frame out of every 24. This results in noticeable jerkiness when the on-screen image is meant to be smoothly moving; it's not noticeable in static scenes. I got fairly used to the jerkiness, but it niggled. In every single pan or zoom, there it was. A related problem arises when playing NTSC source data that's 30 frame per second, as a lot of it is - 30 fps is the standard NTSC television frame rate. PAL 25 fps playback of this data means dropping one frame out of every six, creating a worse, but different, jerkiness problem. Clever motion analysis, which lets a decoder pick which frames to drop, and dropping single fields instead of whole frames can help, but the SigmaDesign drivers can't do this yet. When playing 24 frame per second video on 60Hz NTSC equipment (it's 60 Hz because it shows very nearly 60 fields per second - you'll be overjoyed to learn that I explain what fields are in the Bob and Weave sidebar) - DVD does a thing called "3-2 pulldown". This means that one film frame is used to create not two but three video fields, then the next frame is used to make two fields, then three from the next and so on. When the fields are interlaced together, the video output frames are made from frame one, then a hybrid of frames one and two, then a hybrid of frames two and three, then frame three, then frame four, then frame five, then a hybrid of frames five and six, and so on. The hybrid frames can be blurry, but it's a simple solution and it doesn't change the playback speed. Once the 30 frame per second video data has been made it's only played back at NTSC's standard 29.97 frames per second (yes, the "60Hz" video I told you about is actually 59.94Hz, just to be annoying), but this 0.1% speed difference is negligible. If you can't stand the jerkiness of PAL playback, you'll need a multisystem TV. But if you don't have one, the conversion process at least makes it possible to watch NTSC on PAL, which is a considerable advance on what pretty much all other DVD playback systems offer. All of the jerkiness problems go away if you watch your DVD movies on your computer monitor. Then, the playback system can just squirt out the frames as they lie without making them conform to PAL or NTSC frame rates. There may be slight frame-duration artefacts depending on how the video system handles mismatches between the screen refresh rate and the video frame rate, but I couldn't see any in my tests. High-end televisions that accept high frame rate progressive (non-interlaced) video can give you the same results on the big screen, but you're talking serious dollars for these. Thanks to the anti-piracy mania of the movie companies, DVD is laden with a multiplicity of anti-copying systems, and all current playback systems, including the Jaton, are required to support the lot of 'em. The region coding system has some anti-piracy value but not much. The chief copy protection method is the venerable and not much loved Macrovision Analogue Protection System. Macrovision adds a rapidly modulated colourburst signal ("Colorstripe") along with pulses in the vertical blanking signal ("AGC") to the composite video and S-Video outputs of all current DVD players. You only get it when when you're playing a disc that tells the player to turn Macrovision on, but pretty much every disc does. What Macrovision does is confuse the synchronisation and automatic recording level systems in pretty much all VCRs so that they can't make a decent copy of the video. Unless you buy a Macrovision-defeating box to put in between the VCR and the DVD player, you thus can't make watchable tapes of your DVDs. Macrovision is supposed to be invisible for viewing purposes, but some TVs and many VCRs (including, for example, my own not-that-old Sharp VC-H80 stereo VHS VCR) have trouble with the signal and distort the image in various obnoxious ways (in the Sharp's case, you get regular brightness pulsing). If your VCR doesn't like Macrovision, you'll have to connect the DVD video out direct to the TV. If you've already got a VCR or other device connected to the TV's video in, you'll have to get a switch box. Hurrah. Macrovision is not a huge reason to avoid DVD. If you've got a remotely recent audio-visual setup, and don't hook up to the VCR's video in, you'll probably have no trouble with Macrovision at all. But bear it in mind; if you get rolling, stripey, pulsing, black and white or otherwise stuffed up video, the DVD system may be working just fine and Macrovision incompatibility may be the culprit. Remember that trying to play an NTSC signal on a PAL TV, or vice versa, can also cause very ugly video. Check that you've set the playback software to a mode with which your TV is compatible. The Magic DVD package is a good deal for the money. It costs about half what you'll pay for a current model DVD player, and it has most of the features, though not quite as much convenience. And you get a DVD-ROM drive that also works as a fast CD-ROM drive - the CD-ROM capability by itself would be worth at least $100 of the $450 (Australian dollars) purchase price. There's no remote, and there doesn't seem to be a way to defeat the five-region-changes-only limit, which is not something I'd put up with in a $1000 player. But for the money, this is a darn good unit. Displaying DVD video on a computer screen is not as straightforward as it might seem. Modern high resolution computer monitors are non-interlaced - the electron beam paints the screen 60 to 100 or so times per second, line by line, going from the start of the first line at the extreme top left to the end of the last line at the extreme bottom right, then sweeping back to the top left to start again. Television doesn't work this way. On almost all TV sets, the electron beam paints only every second line on each sweep - all of the odd-numbered lines, then back to the top left to do all of the even numbered lines. Each of these every-second-line sets is called a "field", and it takes two of them to make a frame. Expensive non-interlaced TV sets run from the same field data, but they double the lines in each field so they can show each field as a full frame. There's no more data there, but there's less flicker because the frame rate is doubled. Note that since fields have half of the data of frames, a video system with the same data capacity as the first example but using interlace would be able to capture six fields to the first system's three frames. In this case, I'm assuming that we've halved the data rate. That's why TV uses fields - to reduce the data rate. Now how do you show these fields on a computer monitor that's not using interlace? The two possible methods are "bob" and "weave". Here's an example of "bob" mode. The lines in a single field are simply doubled, which is the same thing those high priced TVs do, so each field can be displayed as a whole frame with reduced vertical resolution. The video is displayed with a frame rate equal to twice the field rate - 50Hz for PAL, 60Hz for NTSC. Bob mode gets its name because it tends to make horizontal lines "bob" up and down. The other possibility is "weave" mode, in which two frames are woven together, as shown here. As also shown here, weave mode deals poorly with fast-moving objects. TV can get away with interlacing fast-moving things only because it's pretty fuzzy. On a close-viewed, high-definition computer monitor, the effects of weaving can be pronounced and obnoxious. Ideally, a decoder system should be able to switch between bob and weave modes on the fly, using bob mode when the image is changing rapidly and weave mode when it's sitting still. The SigmaDesign RealMagic EM8300 "Quasar" chipset used in the Magic DVD decoder board can do this; most if not all other computer DVD decoders at the time of writing can't.